"I got this recipe from my sister, who searches for delicious and unusual dishes. This one lit up the family, and everyone loved it. As it got passed around to family and friends, slight changes occurred. For instance, you can omit the cilantro if you don't care for it or use less nutmeg and more cloves; the possibilities are endless. Just be sure you use caution when working with habaneros. Rubber gloves would be ideal." In a food processor, combine onion, garlic, habanero pepper, and ginger. Pulse until ingredients are minced. Blend in olive oil, brown sugar, vinegar, orange juice concentrate, soy sauce, cinnamon, nutmeg, cloves, cilantro, salt, and pepper. 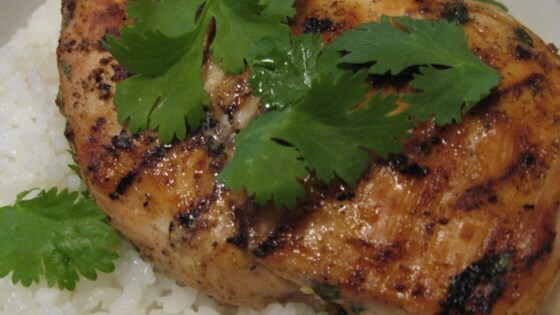 In a container, combine marinade with chicken. Cover, and refrigerate overnight. Grill chicken for 10 minutes per side, or until no longer pink and juices run clear. Wonderful on the Grill, careful with the Habanero it can bite!